In February, Congressman Tim Murphy (R-PA) was a keynote speaker at a public event about “Fixing America’s Mental Health Care System” that was sponsored by the pharmaceutical companies Lundbeck and Takeda. Now, data on OpenSecrets.org show that pharmaceutical companies and psychiatric hospitals are in fact among the main funders of Murphy, who for several years has been strongly promoting his bill the Helping Families in Mental Health Crisis Act. And it appears that those same pharmaceutical companies and psychiatric hospitals are likely to substantially benefit financially if Murphy’s bill becomes law, according to an analysis of the bill. A 2013 analysis of the bill by the National Coalition for Mental Health Recovery, the Bazelon Center and other groups stated that Murphy’s Helping Families in Mental Health Crisis Act would “heavily encourage the use of force and coercion” — typically involving treating people with pharmaceutical drugs — while undermining rights and legal supports for people seeking non-drug options or wishing to make their own decisions. The bill, they stated, would also cut funding to community-based services that “have a proven track record in helping people stay out of the hospital,” and would instead lead to many more people being more frequently placed in psychiatric hospitals for long periods. “(T)his bill would cost more money for worse outcomes,” their analysis concluded. Who supports expansions to involuntary treatment with pharmaceutical drugs and more and longer hospital stays? 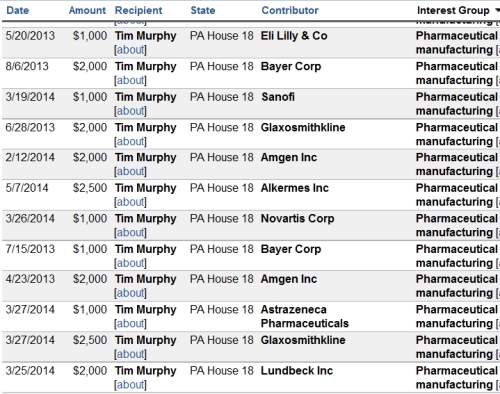 According to data publicly available on the Center for Responsive Politics’ OpenSecrets.org website, in the 2014 election cycle, Murphy’s top funders included “pharmaceuticals/health products” corporations, “health professionals,” and “hospitals/nursing homes” — all of which stand to gain financially if his bill is implemented. MapLight similarly shows that supporters of Murphy and his bill specifically have included Eli Lilly, Johnson & Johnson, Bayer, Astrazeneca, Pfizer, Novartis, Lundbeck, Merck and many other pharmaceutical companies, along with the National Association of Psychiatric Health Systems, a trade group representing the nation’s private psychiatric hospitals and residential treatment centers. The web of connections is way worse than represented here, Rob. As per Open Secrets (https://www.opensecrets.org/lobby/billlobs.php?id=hr3717-113), the NRA had actually assigned 13 separate lobbyists for this bill in the last Congress. What was the name of the study published I think last year, showing that public opinion has zero influence on policy as opposed to the monetary contributions from rich individuals and companies? In any case it’s not only a problem of big pharma – it’s a problem of living in a de facto oligarchical system. US Senator Shelley Moore Capito (formerly Congress women from WVa. Second District), was a co-signer on Murphy’ s most recent mental health bill. The two attend pro-coal conferences together and are pictured standing behind Boener with regards to the Keystone pipeline. I had the occasion to stop by her office on Thursday to voice opposition to her signing of the anti-negotiations with Iran Letter. If Murphy and Capito seem to be reviving this measure, I will be glad to again voice my disapproval in person. Thanks for this information on Congressman Tim Murphy. I followed up on some of your citations and links and heard him say in his “Fixing America’s Mental Healthcare System” event last month, that he hoped to reintroduce H.R. 3717 as early as March of 2015. In his speech to the American Psychiatric Association last May, he was introduced as “a friend of psychiatry;” he commented on feeling at home among like-minded people. The APA president, Paul Summergrad, said the APA was pleased to work with Congressman Murphy “to craft the best bill to benefit the American people.” He has continued to lobby for support of H.R. 3717 and as of December 2014 had 115 cosponsors of the bill, with 34 organizations supporting the bill—with several medical and psychiatric organizations. OpenSecrets.org reported that within Murphy’s top 20 contributions from industry were health professionals, pharmaceuticals/health products, hospitals/nursing homes, and health services/HMOs. Murphy received over $283,000 from the political action committees related to these industries for the 2014 election cycle. There were individual contributions in addition to these. His campaign committee reported that during the 2013-2014 fundraising cycle they raised $1,854,010. In his political career from 2001-2014, he has received $701,235 in contributions from health professional political action committees, and $430,030 in contributions from pharmaceuticals/health products political action committees. The article failed to mention that he is DR. Tim Murphy (Ph.D. Psychology) and that he was in practice for 30 years. I know Psychologist can’t prescribe drugs, but I wonder how far back his connection to big pharma go? I know there are a lot of Psychologist who “recommend” that their clients ask their primary care doctor to prescribe them certain drugs. I wonder if Murphy was one of them and what kind of kick-backs he received for doing so. I am on of the very few people who can do something about Murphy and when he comes up fro re-election in the district I live in I will for the first time ever vote Democrat! I’m sure I’ll get some strange looks from my neighbors with a Pro-Republican Presidential sign and a Pro-Democrat Congress sign on my lawn! I’m pretty sure he is in a gerrymandered district. He ran unopposed in the last election. Anything you can do to help defeat Rep. Murphy would be great. But I would not put too much hope in the Democrats either. In my benighted state, psychologists now can prescribe psychiatric drugs. They wanted to get in on the drug-dealing and the heavily Democratic legislature gladly obliged, for once acting in opposition to the psychiatrists, who fought the law for obvious, self-interested reasons. My letter to my representative (a prominent Democrat) got a perfunctory, meaningless response; the representative voted to allow psychologists to prescribe psych drugs. One way to look at it is that they are all bought and paid for by Big Pharma), but it is also hard to convince legislators to oppose a measure that is supported by NAMI. Murphy his bill and his backers are trying to send American families including children on a Titanic like voyage through intense Hell which, the unthinkable passage of his Orwellian doublespeak bill would do. Better that Murphy, his bill, and his backers , alone go on a Titanic like voyage and disappear. Better sooner then later. Murphy received his Ph.D.in psychology from the University of Pittsburgh, where he was an assistant professor. He was also in private practice in the Pittsburgh area. The Pitt-connected Western Psychiatric Institute and Clinic (WPIC) is a very entrenched medical model facility. Pathetic and outrageous but not at all unexpected.